In the absence of even a Sturmgeschütz assault gun or AT-gun, these Grenadiers are taking on allied armor close up and personal. The cheap and effective Panzerfaust was churned out by the millions and was able to damage or destroy nearly any allied tanks with its hollow charge warhead. From the Bocage in Normandy to the desperate struggle in the east, this is the last line of anti-tank defense for any German late war army. 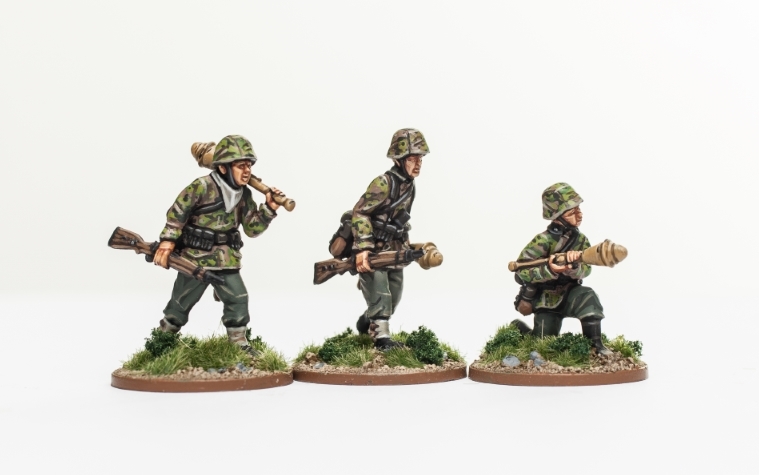 The Panzerfaust soldiers consist of 3 highly detailed 28mm scale miniatures and are armed with the common Panzerfaust 60. All are made from white metal and are supplied unassembled and unpainted. Glue and paints not included.